The pharyngeal constrictor muscles are relaxed during low-pitch phonation. Notice the open pyriform sinuses. During high-pitch phonation, the pharyngeal constrictor muscles contract (in direction of green arrows) to obscure the pyriform sinuses; the midline is now evident (blue arrow). 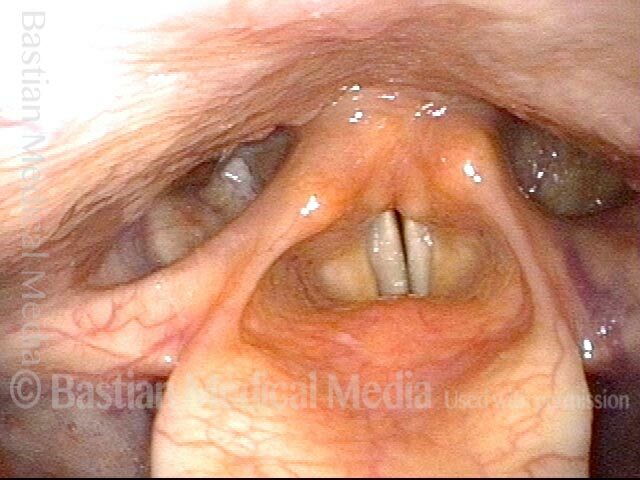 At low vocal pitch, the pharynx is uncontracted; pyriform sinuses are both widely open. At high pitch, the pharynx contracts and surrounds the larynx more closely; pyriform sinus capacity is reduced. 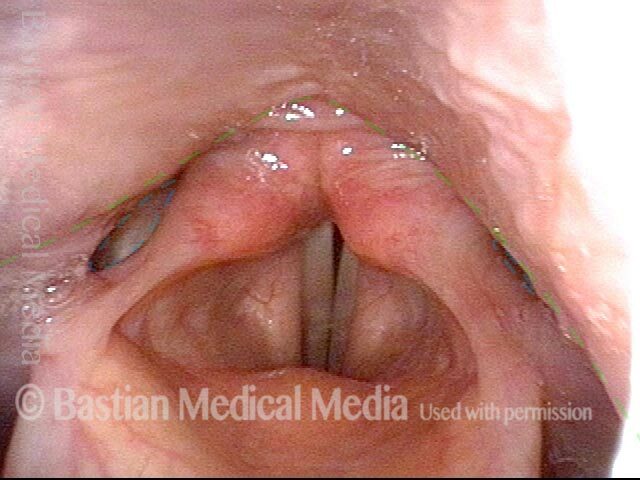 Laryngopharyngeal view of a young woman, phonating at F4 (~349 Hz). Here the pharynx is relaxed: notice the broad arc of the pharyngeal wall (green dotted line) and the widely open pyriform sinuses (blue dotted lines). Same patient, now phonating at C5 (~523 Hz). The pharynx has contracted: notice the narrower, more pointed arc of the pharyngeal wall (green dotted line) and that the pyriform sinuses (blue dotted lines) are nearly closed. In this relatively young soprano, this degree of pharyngeal contraction should not occur until she sings as high as G5 (~784 Hz) or higher. This singer is experiencing loss of expected upper range—a lowered “muscular” ceiling of the voice.